I first came across this product at a little store called ‘Friendly’s Grocery’ in Fredericton, New Brunswick, almost thirty years ago and I loved it the very first time I tasted it. It is not always easy to find and I have gone for several years at a time without seeing it anywhere. When I came across it in a store in Ottawa’s Chinatown on a recent visit I naturally bought every can they had. 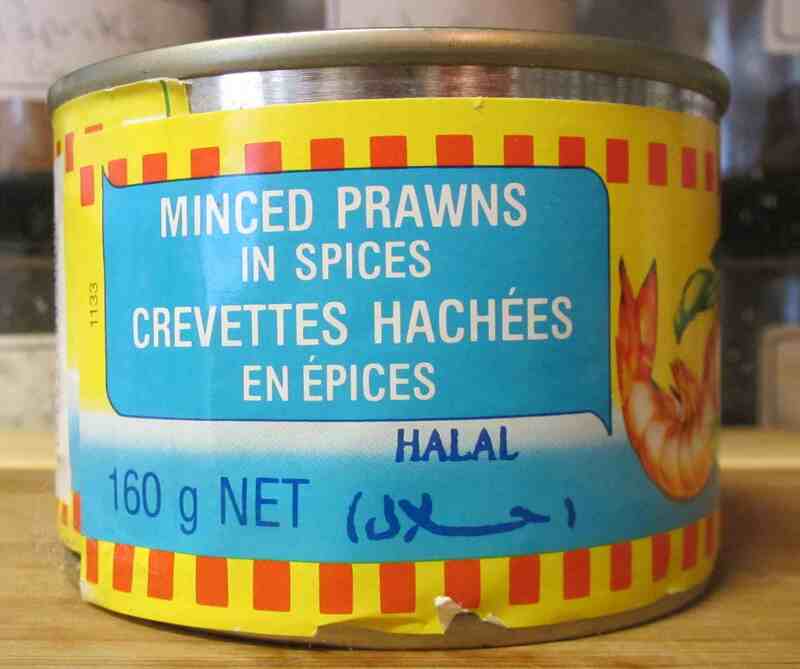 Although the English name of the product is ‘Minced Prawns in Spices’ the only spice listed on the label is Chili. Peanuts and Onions are included but these are obviously not included in any great amount as the taste of either of them is not readily apparent. The paste, as you can see, has a lovely reddish-orange color and is quite oily. Refined Palm oil is used and, while it is liquid at room temperature, it solidifies when you keep the paste in the fridge. The taste of the product, I have to say, is amazing. The dominant flavor is the slightly pungent, almost fermented taste of dried shrimp, and the chili used just adds a nice background heat without being overpowering. It is quite similar to a Sambal Belacan without Lime juice, or a Sambal Terasi without the very strong fermented taste that Terasi often has. My only real complaint about this paste is that it doesn’t work well in hot dishes as the best highlights of the cold product are lost when heated, I have used it as a base for sauces, and also stirred into hot noodles, but I have always been a little disappointed and, accordingly, mostly just use it cold. My absolute favorite use for the paste is as a spread on ham sandwiches where it adds a truly delicious and exotic taste dimension. When I opened a can to take pictures for this post I wanted to use it right away and so I used some to make the appetizers you see above. 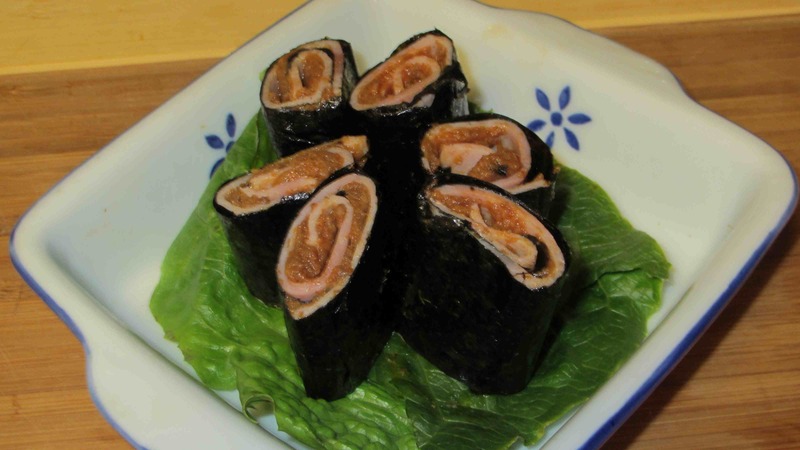 These are actually nothing more than ham slices spread with some of the paste and then rolled up in a sheet of Nori. My wife is not a big fan of ham sandwiches, so I had to forgo that particular pleasure, but both she and I really enjoyed these little treats. WOW, I need to find some of this. Looks pretty good. Yet another product we don’t get here. That sounds really good. I may have to see if I can find some at an Asian grocery store here. Can you tell me where I can get this product? How much? This product is great in stir fried noodle dishes. Your little ham rolls look like a fun idea as well. Looks great sir. On the hunt to china town or my dear Chinese friends this week! On the hunt for this great looking spice! Reblog *really* appreciated this time… it would be great if some of your readers recognize this product. This sauce is very commonly available in Chinese groceries here in Vancouver, BC. In fact, I just bought some today and found this blog while looking for recipes. I bought it an Chong Lee MArket at 6399 Victoria Drive. It is on the second or third row of shelves right at the back of the store. For spicy food lovers like me (born in India, I was spoiled for bland food in the cradle), Chong Lee’s is absolute pig heaven. They have “Magic Peanuts” (peanuts with dried chillis and sesame), a whole aisle full of spicy stuff from Chilli-picked Baby Eggplant to Chilli Paste with Holy Basil to Radish Strips Pickled in Chilli Oil, to a glorious, locally-made No-name Chiili Oii made with shallots, died prawns, chlli and and garlic. I ave to buy it in large amounts whenever I see it. Luckily, I have quite a stock right now. I am really hoping someone from Singapore or Malaysia might write and tell me more. This product,I’ve been using for close to 30 years!…I put it on toast by itself or fresh bread! Also it is great on pasta ,even with some ground parmesan on top!..It is hard to find here in Perth ,much harder than ever before. 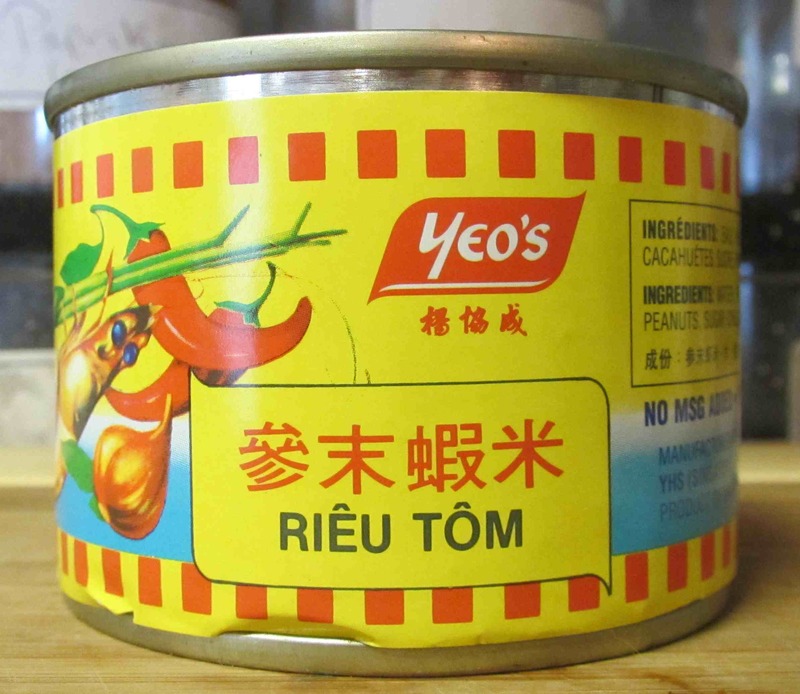 Don’t get it confused with a vietnamese copy..that is horrible!..I have even polished off a few tins on there own!! Yeah … I’ve had the copy. Really heavy on Galingale and Lemongrass …. overwhelms the prawn taste. I came across to this blog when i am trying to look more recipes for this particular products. I am a Malaysian but currently staying in Melbourne Australia. I am also currently working in a food import company, where finding ways to promote this products, but unfortunately, this product is not popular on the market, so is quite hard to find recipe for it. But we Malaysian really enjoy this particular products. If you don’t mind i share some ideas for using this product. This was taught by my colleague who was also Malaysian. Not sure have you heard of a soup noodle dish called “Hokkien Prawn Noodle”, is a very popular hawker food in Malaysia, particular in a state call Penang. Although this may not be the authentic or correct way to make this noodle soup, but is a very delicious meal. 5) give a stir time to time until it boiled. I usually will prepare on personal preference, except the soup can’t be altered. 5) pour everything in a bowl. Like i mention, ingredients are quite optional as long as you got the soup right. Apologize if is too much information for you, as i not sure whether are you familiar with the ingredients i mention, so i put in link for images. And forgive my grammar. Sorry, is suppose to be spinach, not spinish! Thank you… Very helpful indeed! Please can you tell me why you have changed the consistency of your great product..the prawn chilli sambal..It has less prawns and is very runny compared to earlier years.The taste is the same ..why not get it back to how it was please? Minced Prawns in Spices…I stumbled by happenstance into Hong Kong Grocery in Tacoma, WA. My intent was to buy ingredients for Thai Pad (never made it, but had a friends forgotten lunch of Thai Pad and knew I had to learn to make it.) So, not having the list of ingredients, I explored HK Grocery and purchased items that I thought I remembered needed for Thai Pad. The dominant item I remembered was Tamarind.Nearby I discovered small cans of Minced Prawns I thought I needed. To make my shopping trip short, I returned home and the next day started my adventure making Thai Pad…then I discovered the recipe called for Dried Shrimp! Not buying any, I decided to use the minced Prawns in Spices. After opening the can, I was horrified at what I saw–oily gunk! I did use the teaspoon required as a substitution for the pounded, dried shrimp while wondering how the hell would I use this stuff!? I searched the internet for recipes and finally decided on the soup recipe by Cien; however, I did not want to take the time to put it all together and did not have all the ingredients, anyway. I continued reading and searching until I found that many preferred it cold, then I found the comment made by Sybaritica	# about liking it best on ham wrapped in seaweed. Ah haa! I’ll try in on my go to snack of toasted tortilla with broiled cheddar…fast and always satisfying; I often sprinkle with cumin seed, chili or both. This time though I knifed a layer of cold Minced Prawns over the cheese once out of the broiler. Divine! I’m so happy I bought two cans of this “goop” in different brands because now I can’t live without it! I have found similar products made commercially but this one is still my all time favorite! What do you mean…commercially…are you saying cooks make their own? I bought many years ago “Cracking the Coconut”; I’ll see what this Bible of Thai cooking says…. I came across your blog while trying to find a stockist for this product in Kuala Lumpur. It seems extinct in the major supermarkets around here and its easier to find it in Asian supermarkets in Melbourne, Australia where I now live. In my childhood I recall using it pretty much the same way you did, as a spread over bread. There’s so much flavour there that ham is really not necessary as an accompaniment. I wanted it to make Bun rieu, a Vietnamese vermicelli noodle dish made with chicken stock boiled with segments of tomatoes. 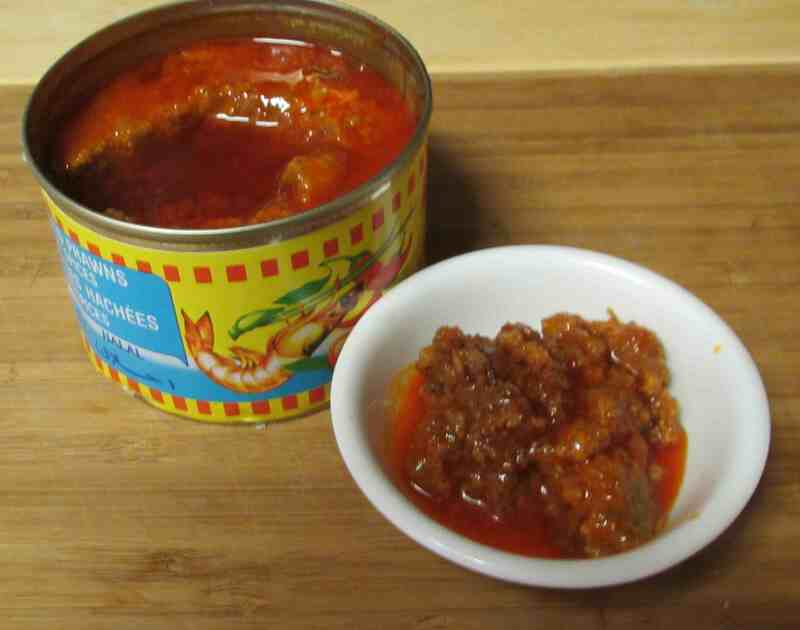 A small amount of mince pork is mixed with raw eggs, a spoon of prawn paste, and the can of minced prawn in spices. The mixture in then spooned into the boiling stock to form loose patties. Fried towfoo balls are added to the soup which is eaten with vermicelli noodles and various salad greens. That sounds like an interesting dish. I have not seen the product in question for a while now but I have found a Philippino equivalent that is almost as good. Yes, this is exactly the product I bought on a whim…I did not know how to use it so I added some to my toasted (melted) cheese and tortillas prepared in my toaster oven. The quick snack is memorable …just use up the product in the proper amount of time. I wonder if it freezes well…something to try…I have one can remaining…very good stuff! I did not heat the prawns…use cold….yum. Mmm… just had it on a sandwich with Pate and it was delicious. I are the first can of minced crab with crackers. I had Lee’s brand and it is a somewhat loose paste, almost a sauce, but both the crab and shrimp flavors are so savory umami. I’m trying not to pull out the baguette and finish off the rest of the can. I also wonder how it would be whipped into cream cheese for an insane seafood dip? Maybe some fresh crab? Avocado?